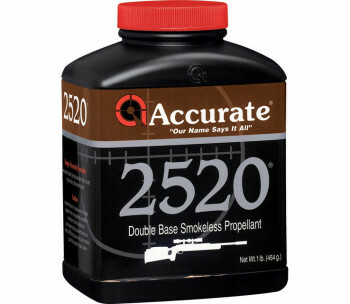 Accurate 2520 is a medium burning, double-base, spherical rifle propellant designed around the 308 Winchester. 2520 is our “Camp Perry” powder and is extremely popular with many service shooters. 2520 also performs extremely well in 223 Remington with heavy match bullets (62 to 80 grain). This versatile powder has superb flow characteristics and is well within the threshold limit for the M14 systems. Made in Belgium.